Help us unlock our collections data for use by researchers across the globe! As part of this year’s WeDigBio event, 19-22 October, we are launching a project to transcribe our Australian Proteaceae. The Proteaceae is an iconic family distributed throughout the Southern Hemisphere with several well know genera such as Banksia and Grevillea coming from Australia. 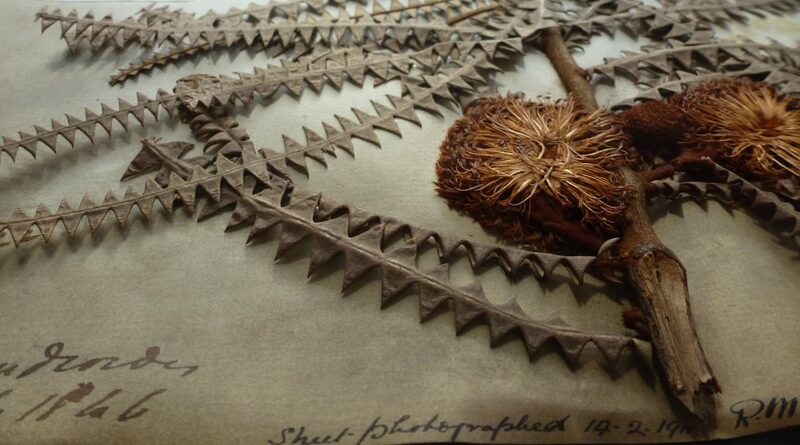 Amongst our collection are specimens collected by Robert Brown from his expedition to Australia between 1801 and 1805. These are of great historical importance as many of which were species new to science! By digitising our collections we can increase the accessibility of our research collections to researchers across the globe. You can help us digitise them by taking part in the transcription blitz. We have only recorded minimal information about the specimen before imaging it enabling us to mobilise specimens from our 3 million strong collection more rapidly. Whilst this makes our collections more visible it means that they are hard to search and their full research potential is not easily accessible – which is why we need your help. Capturing specimen information digitally allows researchers to build a picture of a species’ historical distribution; these can be compared to current distributions to see if any changes have occurred, such as a decline in numbers. Specimen labels may also provide clues to help explain these changes, for example, habitat information recorded at the time of collection can be compared with current land use in the same locality. The specimens alongside the collection label can also be used to monitor phenology, such as flowering time. Changes in flowering time can be monitored and correlated with climate, meaning specimen data can provide us with information on the impact of climate change on plants and indirectly on pollinators too. Thus digitisation helps inform and target conservation efforts protecting plant species for future generations. Go to our Proteaceae of Australia page to take part! To find out more about WeDigBio and other events that are being run across the world visit the WeDigBio website and their events listing page.